Supernova remnant DEM L316A lies in the Large Magellanic Cloud some 160,000 light-years away in the far southern constellation of Dorado. Image credit: ESA/Hubble & NASA, Y. Chu. This NASA/ESA Hubble Space Telescope image captures the remnants of a long-dead star. These rippling wisps of ionised gas, named DEM L316A, are located some 160,000 light-years away within one of the Milky Way’s closest galactic neighbours — the Large Magellanic Cloud (LMC). 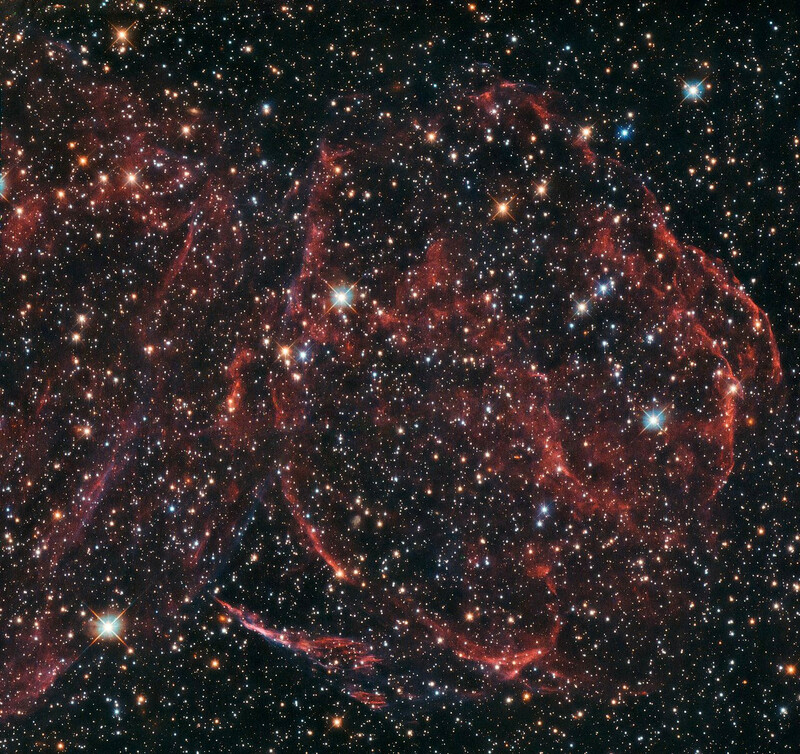 The explosion that formed DEM L316A was an example of an especially energetic and bright variety of supernova, known as a Type Ia. 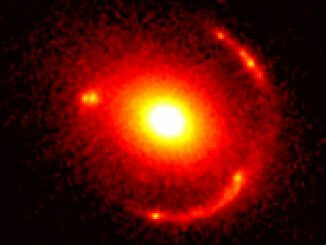 Such supernova events are thought to occur when a white dwarf star steals more material than it can handle from a nearby companion, and becomes unbalanced. The result is a spectacular release of energy in the form of a bright, violent explosion, which ejects the star’s outer layers into the surrounding space at immense speeds. As this expelled gas travels through the interstellar material, it heats it up and ionises it, producing the faint glow that Hubble’s Wide Field Camera 3 captured above. 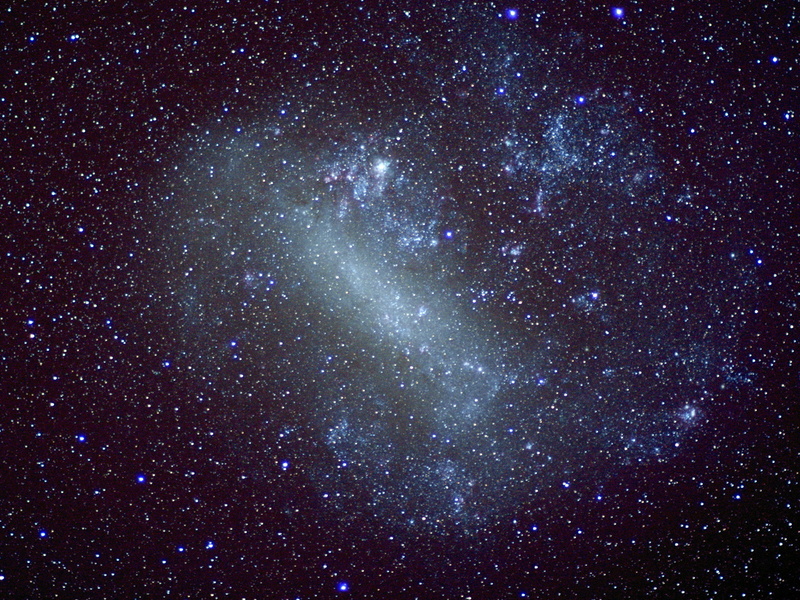 An image of the Large Magellanic Cloud captured with a DSLR and 85mm f/1.4 lens from New Zealand on 10 December 2015. Image credit: Ade Ashford. 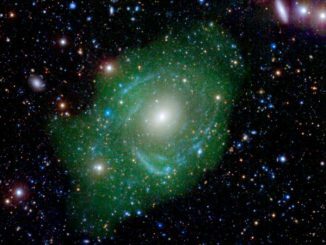 The LMC orbits the Milky Way as a satellite galaxy and is the fourth largest in our group of galaxies, the Local Group. DEM L316A is not alone in the LMC; Hubble came across another one in 2010 with SNR 0509, and in 2013 it snapped SNR 0519. 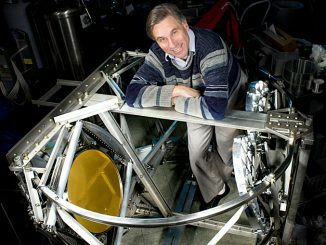 Due for launch in 2020, ESA’s Euclid satellite will set astronomers a huge challenge: to analyse 100,000 strong gravitational lenses. The gravitational deflection of light from distant astronomical sources by interposing massive galaxies can create multiple images of the source that are not just visually stunning, but are also valuable tools for probing our universe.